TOLEDO, O.H. -- The University at Buffalo cross country teams concluded action in the 2018 MAC Championships on Saturday at Toledo with the UB men collecting a fourth place finish and the women taking home 12th place. Redshirt Junior Caleb Covell was able to collect First Team All-MAC honors after collecting a fourth place finish in the men's 8K race. Junior William Hilbert was also recognized for his outstanding 2018 campaign as he was awarded with Second Team All-MAC honors after his 13th place finish in the event. On the men's side, the Bulls were able to claim a fourth place overall finish with a score of 177. The finish was two spots better than the sixth place finish at last year's event. Covell led the way at the MAC Championships for Buffalo as he was once again the top finisher for the men's team for the 8k event, crossing the line in fourth with a time of 24:36.8, earning him his first career All-MAC honors. 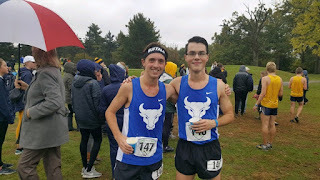 Hilbert ran his best race of the year for the Bulls, as he crossed the line second for the UB men, claiming a 13th place finish in a season-best 8k time of 24:58.2. Sophomore Thomas Flannery was the next Bull to cross the line, securing 33rd in a time of 25:38.5. Just behind him and rounding out the top-40 for the Bulls was Sophomore Christopher Nowak in 36th (25:40.9) and Oscar Vazquez in 37th (25:41.5). For the UB Women, the squad finished in 12th place with a score of 335. Leading the way for the Bulls on the afternoon was senior leader Lauren Reyda who clocked in a time of 22:22.2, good for 37th place. Also running hard for UB was junior Chardae Henry who finished with a season-best 6k time of 23:01.2. Junior Brittany Fuller finished right behind Henry, also securing her season-best 6k finishing time of 23:02.3. The Bulls will return to action on November 9 as they will host the NCAA Northeast Regional Championships at the Audubon Golf Course in Amherst. For all the info on the NCAA Regional meet next Friday, click HERE.